On an email list, a recent topic was business cards, with a diversion into Victorian calling cards. Since the list’s purpose is discussion between authors, and since some of them write historical books, Victorian calling cards is a logical topic. During the discussion, someone mentioned the calling cards of the wives of foreign service officers with the U.S. State Department. That led to a comment about how military wives traditionally called on each other and left calling cards. That practice must have been only among officers as I don’t remember my mom ever having calling cards (Dad was career Army/Air Force enlisted with a short stint during WWII as a warrant officer), and I know I didn’t have cards (my husband was career Army, also enlisted). The development of the ritual of calling on other wives may have been due, in part, to older social patterns that hadn’t yet disappeared. I remember my dad saying that when he joined the Army, enlisted men had to live in the barracks, married or not. 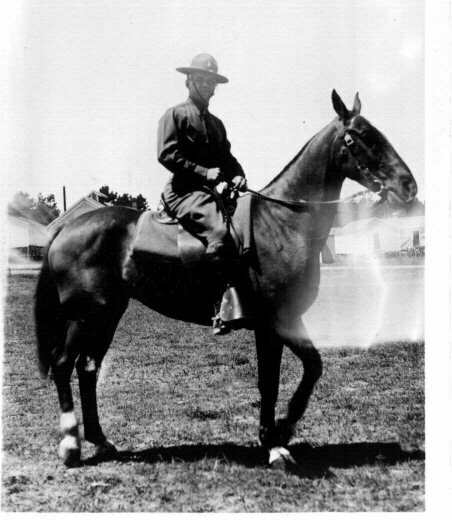 In the 1930s, the Army still had horse cavalry, even though we now think of the cavalry as only something in the wild, wild West. 1939 Dad on Warwhoop at the Presidio of Monterey. Another possibility is that the social events provided the women with a purpose other than staying home with the kids. Women did work, but in a transient environment, employment can be a tricky business. Even when I was a kid in the 1950s, some of the moms in the States worked outside the home. Among my civilian relatives my godmother was a nurse and instructor in a teaching hospital. Other aunts who were the wives of farmers stayed very busy with the work of chickens, eggs, gardens, and being the support staff for field workers during harvests. The problem for wives of military servicemembers was, and is, a restriction on job availability. I imagine State Department wives had the same difficulty as overseas military wives in not being able to find jobs on the local economy because of language fluency challenges in jobs other than entry-level, local work permits, tax complications, etc. Entry-level jobs may have also been prohibited for wives because of the dissonance of attending State Department functions in a higher social capacity than any low status job could provide. A grocer’s clerk wouldn’t have been seen as a suitable person for shaking the hands of an ambassador. On overseas military installations, status of forces agreements and treaties required the US to provide X-number of jobs to local nationals as payback to the host nation for allowing the troops to be in the country. Quid pro quo. For a long time, military family member jobs were of low priority. Even after jobs-for-family-members came to the forefront, any job had to be unsuccessfully offered to local nationals before being advertised to military family members. That was the existing diplomatic environment and it wasn’t about to be negotiated away when the families-in-country were temporary and local workers were permanent. Recruitment for higher-paying American technical jobs took place in the States among career Civil Service employees and those employees were transferred in and out just like their military colleagues. No wives need apply because they were never in the running. Teachers in schools for military kids was one area where local hiring did favor family member spouses because of the English-language fluency requirement. In the States if the wives followed their husbands on assignment after assignment (not everyone did) they would be starting out fresh in new markets every few years. Even if the wives were career Civil Service employees, the location to which the service member was transferred needed to have a job available in the wife’s career field and at her grade-level. One of my jobs was as a GS-02 school playground monitor. $5.00 an hour. The other playground monitor, and the lunch-room monitor, were the wives of officers. More than one career Civil Service employee has shown up at the civilian personnel office for her new home, with her job status being in the holding pattern of LWOP — leave without pay. The employees were often under the impression that career-status made them shoo-ins for employment only to find out that the installation not only had no open jobs but the one job for which they were qualified had just been filled. If they still submitted an application, the job would often open up a couple years later, just as they were getting ready to leave for their husbands’ new assignment. With so few jobs available for so many family members, it’s no surprise that the women developed a social structure in which to function. Installations have only a limited number of jobs especially since the local civilian population is stable. A civilian employee has to die, retire, or move someplace else in order to create a vacancy. For many of the women, volunteering with Scouts, family support organizations, Gray Ladies (Red Cross), chapel activities, and schools took the place of paid work. Kindley AFB, Bermuda, 1965: Me and my mom with our pre-clip-art, completely homemade poster for Girl Scouts. No idea why we have snow-capped mountains in the picture. Nostalgia? With the rise of the Internet and various business opportunities, some wives of military members can have jobs that they can take with them. Tupperware and Avon provided portable jobs in the past. Etsy and eBay — not to mention telecommuting — might be the most common now. Social events with rituals such as calling cards probably provided a sanity-saver for women who had to create temporary homes for their families time after time. The formality of coffees, teas, and calling cards mirrored that of the military’s rank structure. Those ancient Victorians, who are now seen as ridiculously stuffy with their silver tea services, their linen tablecloths, and their china tea sets, did leave a card legacy for their successors. Some of today’s military wives — and the increasingly less-unusual military husbands — do have cards. They have their own business cards.